Want a vacation without leaving town? While there are plenty of magical places around the globe to visit, and plenty of inspiration—including your zodiac sign—to help you discover unique travel experiences, you can still get the same change of perspective from an experience much closer to home. We’re talking about sensory deprivation tanks—otherwise known as isolation tanks or float tanks—and they might just be the best way to elevate your mindset, fast. But what exactly is a sensory deprivation tank? It’s an enclosed tub, traditionally about the size of a small car, filled with about 12 inches of body-temperature water, and around 1000 pounds of Epsom salt, which allows you to float. Float tanks are soundproof and light-sealed, creating a space in which your senses are deprived of outside stimulation; they’re also filtered and treated after every use, so you don’t have to worry about germs. The primary purpose of a sensory deprivation tank is to place the user in a meditative state, which research suggests can be useful in treating stress and anxiety-related conditions. Some users say floating provides relief from inflammatory conditions and muscle and joint pain. Others say the experience unlocks their creativity. Sensory deprivation can invoke hallucinations and out of body experiences—even states of enlightenment. It’s said John Lennon used a float tank to help him kick heroin in 1979—yes, isolation tanks have been around for that long! They were first invented in 1954 by the neuroscientist John C. Lilly, who teamed up with computer programmer Glenn Perry in 1972 to make tanks for the public. 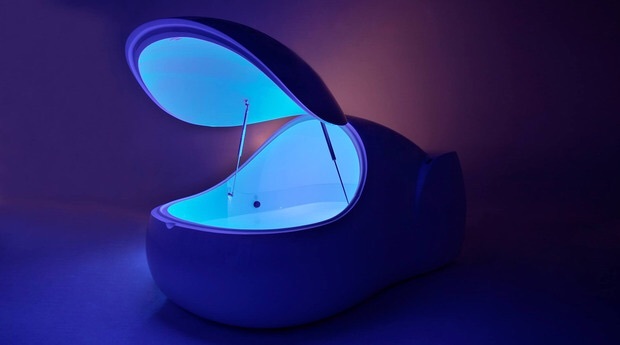 Some float spas allow you to float with the lights on, and some tanks are shaped less like pods and more like rooms, open and with higher ceilings. Sessions last an hour to an hour and a half. Some things to know before going: First, think physical comfort strategies. Avoid shaving or waxing beforehand, as the salt might irritate your skin; and skip coffee if you can. If you’re a little claustrophobic, your float technician might suggest using a towel to crack the lid of the tank slightly. You shower before and after, and you float in the buff. Be prepared for a range of feelings and experiences—each float is different. You might have a magical epiphany on your first float, then never again; or you might not experience a truly meditative state until the third or fourth time you try it. Floating can cost a pretty penny (anywhere from $65 to $99, though there are often first-time-float deals). For many, float therapy is a way to reset and recharge like no other. If you plan to try it, check out the website Floatationlocations.com for deals and to find float centers near you. And, if you do decide to go, surrender to the experience—it works best if you go in with an open mind.